When this month’s Better Homes & Gardens arrived in my mailbox, I was excited to find photos of novelist Mary Kay Andrews’ charming “Breeze Inn” inside. When Mary Kay and her husband Tom bought the Tybee Island cottage, it was painted “egg-yolk yellow with circus-blue trim.” They wanted it to resemble the Florida beach houses of the ’40s, so they repainted it a mint green with a hot-pink door. It’s now a vacation rental where you can stay on your next trip to Georgia. Take a look! 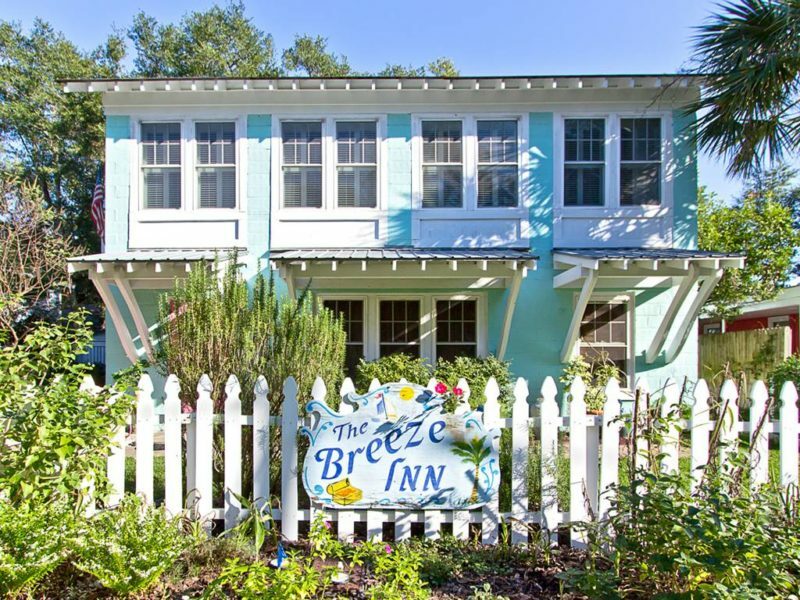 Breeze Inn is a circa 1943 remodeled beach cottage that is located only 2 short blocks away from the beach. This cottage has charm and beach style elegance everywhere you look thanks to it being decorated from top to bottom with family-friendly vintage and antique finds collected by the owner, bestselling author Mary Kay Andrews, from around the country. What would a novelist’s house be without bookshelves? The Breeze Inn has 3 bedrooms and 2 bathrooms. Mary Kay loves fixing up old houses and shopping for treasures to fill them with. Want to stay at The Breeze Inn? Check Tybee Vacation Rentals for more photos and information about the cottage. You can read about her novels on her blog and more about the cottage in the article at Better Homes and Gardens. Hey, Julia! I got to meet Mary Kay & she’s a doll. She sent me the book too & I’m reading it right now also. Very clever and I was drooling over her beach cottage too in BHG. So pretty! .-= Rhoda @ Southern Hospitality´s last blog ..Cute Roman Shades Giveaway =-. I have been a MKA fan for some time and have read all of her books to date. How fun is her house? Love the colors and light. Thanks for posting this. .-= Christi at A Southern Life´s last blog ..img-6437 =-. .-= Janell Beals´s last blog ..Watch As I Jump Around The House From Room To Room =-. Fabulous … Adorable cottage… I did a painting of it for Mary Kay Andrews… You can see it in My Painting Gallery… category: Tybee… Come take a peek! .-= Fifi Flowers´s last blog ..Paris Umbrellas =-. Love her colorful cottage. SO ME! That sunroom was just too cute. Love the SEA on the wall. I can’t believe I’m a blogger. I started out so scared and not knowing what to say and somehow everyday the words just come. It amazes me:) A few people have suggested I write a book…which to me sounds hilarious. I think blogging is just what I was made to do. Although it would be nice to get a paycheck! .-= Becky @ Farmgirl Paints´s last blog ..Pierced =-. I love Mary Kay Andrews books to much so that when “Fixer Upper” was released in hardback I just could not wait. Better than chocolate! Actually all her books are. Her house is lovely! I too love the framed book covers. I’ve never seen that before and find it quite clever. I also wanted to mention that I sure do enjoy your blog. You are a wonderful blogger – certainly one of my favorites – but it’s never too late to try the novel thing again, you know? Oh Huney…you have a novel in you. I just KNOW you do. When the time is right it’ll come. This blog stuff is all prep! Love her house, and looking forward to reading her book! Tybee sounds like a writer’s paradise! .-= linda@LimeintheCoconut´s last blog ..Donuts anyone =-. Thanks so much for posting – I just read that book “fixer upper” this weekend – I couldn’t put it down and was so sad it was over. I ordered all of her books for my summer reading list – thanks for posting her home photos – will go and check out the rest of them. This place is adorable! I am a little in love with that turquoise entry way shelf, and that little framed bathing suit. .-= hip hip gin gin´s last blog ..Succulent Love =-. How fun and I am so excited to read her book!! Color, color. color!! .-= Karena´s last blog ..Pillow Mint Giveaway -amp Town Art Show 2010 =-. .-= Nancy@marcusdesign´s last blog ..have you heard domino archives available online =-. I really enjoyed your post about MKA. I am new to your blog and love it. Thanks for sharing! .-= Cheryl Elsbree Interior Design´s last blog ..Interior Musings 1 =-. 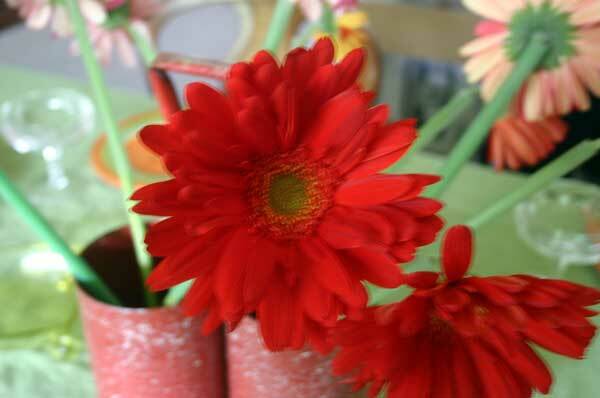 .-= Amanda @ Serenity Now´s last blog ..Easy- Kid-Friendly Treat for the 4th- =-. Love Mary Kay Andrews but love her best as Kathy Hogan Trochek. She writes some great mysteries involving a cleaning service in Atlanta. 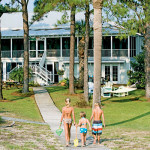 My hubby is from Savannah so I plan to look for her beach house the next time we are at Tybee. And Julia, should you ever write a book, I will buy it. Another one of my blog friends, Marybeth Whalen just had a book published, The Mailbox. So there is hope that we bloggers may one day become authors!! Keep up the good work, love your blog. I’ll have to look for her books. I’ve not read any yet….don’t hate me! As an avid reader, though, I am always grateful for book suggestions. The Tybee Island home is so lovely. One could definitely be inspired there! .-= Becky K´s last blog ..Lilies and Hydrangea =-. That Mary Kay is a busy woman! I don’t know when she finds time to write; she’s everywhere, while I’d be back on the porch at the beach cottage napping away! I love the colorful warm colors of Mary’s Inn. They make the house inviting. I have never read any of her books, but I just might have to, they sound so good. Linda–thanks so much for blogging about our home and my books on hooked on houses–you’re on my short-list of must-read blogs. As for writing a novel? I’d never done it before I did it–was a newspaper reporter for 14 years and then decided I wanted to stay at home with my kids. Follow your heart and just do it–wait, was that what the wizard of oz told Dorothy? This house is so colorful and fun! Exactly what a beach-esque house should be like in my opinion. That sounds like a really interesting book! I haven’t heard of it, but definitely am going to check it out now, thanks! .-= Laura (youngDCliving)´s last blog ..This -amp- is Bananas- B-A-N-A-N-A-S- =-. When I got my BHG in the mail a few weeks ago I was instantly taken with the Tybee Island cottage…just my style. 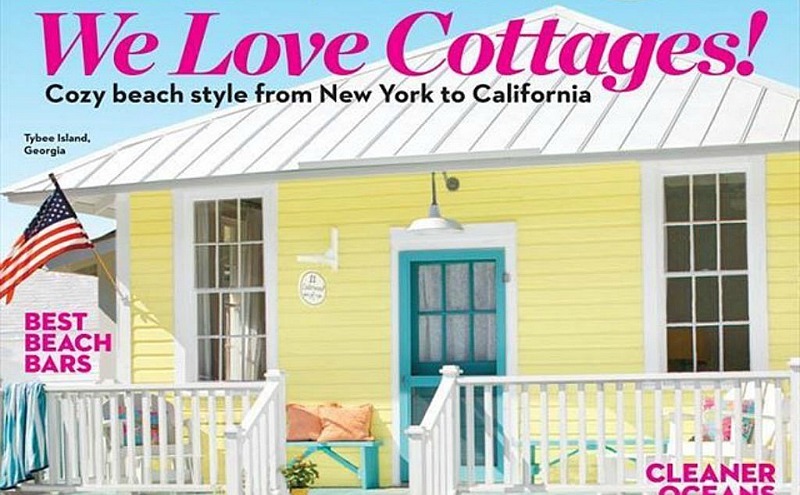 Last night I happened upon “The lettered cottage” blog and saw Layla is decorating some Tybee cottages…so I googled the Mermaid cottages and oh, how I want to visit that island now. 🙂 Right now I am leaning toward decorating more vintage beachy in a bedroom and bath (gotta get those seashells back I gave to my sister that a friend gave to me & I didn’t think I’d want them – hee-hee). I’ll check out Mary Kay’s book…sounds neat. Right now I am reading “Cottage for sale, must be moved” (recommended on a post on another blog…gotta love our common loves in blogland). .-= Lori-Anne´s last blog ..Book Exchange Part II- The Last Song =-. I first heard about Mary Kay via Rhoda and added her to my blog roll, thanks for the tip I am always in the market for a good book………how neat to see her cottage in my BHG, I just may get down to Tybee in the Fall…..my daugher recently moved to GA she is at a training facility there…..so we plan on heading down to visit !!! I would love to take a side trip. I saw that Layla was down there too…..
Have a great week and Happy 4th……I have been ill this week so not doing much blogging…. I need a good read – I’m going forth immediately to find Mary Kay Andrews, thanks for the tip! .-= Tricia Rose´s last blog ..Lavender Festival =-. Enjoy your summer days, is freezing here is in Aus. Oh, the idyllic life! The book sounds darling and a perfect summer read! Now, to find a quiet corner…. I immediately LOVED her cottage when I saw it in BHG. Thanks for blogging on it. I also love the bright green slider on the porch!! I could curl up on that with Mary Kay’s book!! .-= Jenny´s last blog ..Baggo Fun =-. do you think she will let me live with her? I’m only a few hours away. Great post! .-= Jessica at Lavender and Lilies´s last blog ..In Desperate Need Of =-. I know, I love this beach cottage. My family and I were actually thinking of going there this summer. I’m afraid I wouldn’t want to leave though. .-= LeAnn´s last blog ..Girls just wanna have fun =-. I love your blog…I love your (blog) writing too! Thanks for showing us all these beautiful homes everyday. We are in FL for the summer helping my mother-in-law fix up a great old house. We are loving it. It’s so interesting thinking how and why people built things the way they did but it’s a lot of fun too. House pics to come on my blog soon! .-= Alicia´s last blog ..What a life- =-. I’m glad you’ve discovered Mary Kay Andrews! Fixer Upper is tied with Hissy Fit as my favorite book she’s written–you should check out Hissy Fit next! I first found Mary Kay Andrews through her book Savannah Blues, which I read while on a trip to Savannah. Like you, I was thrilled to see her Tybee home in BHG. .-= Julie @ The Family CEO´s last blog ..Hanging a Wall Photo Gallery =-. .-= Goldenberry´s last blog ..Le Cap aux Morues-Cape Cod suite et fin =-. Love it! Those picture groupings are fantastic! .-= Jess @ Frugal with a Flourish´s last blog ..Tips for Shopping at Ikea =-. Very sweet house. And how cool that you’ve made a connection with an author you like. So nice. .-= Lesley @ TheDesignFile´s last blog ..Design Star- Nina says shes a leader- not a bully =-. I just finished reading my first MKA story – Savannah Breeze. I picked up Blue Christmas yesterday at the library and read half of it last night! LOL. I just love her style. .-= Janet ´s last blog ..Another Give Away =-. Read Savanna Blues next. It’s the story of Weezie who is one of the characters in Savannah Breeze. I liked it even better. I’m currently reading my third one, Hissy Fit. I enjoy how she adds a little mystery to her stories and of course I love all the decorating stuff. .-= Amber´s last blog ..hellokittencake-vintagerosegarden-dreamsmaylinger-via doll =-. I will finally go to Barnes & Noble and get a book of hers, because I meant to and I let life get in the way and now I have a reminder. I’m off to get a Mary Kay Andrews book. Thanks, Julia. And I have written two novels, Julia, after my kids got older, started two years ago and have always loved writing, so I went for it and surprised myself. The difficult part for me now is sending in query letters and just going for it. The process is intimidating. .-= Kim @ Blue Heron Cottage´s last blog ..Finding Beauty Friday- =-. What a happy fun cottage! Love the bright colors and look forward to reading a new author for me! Like so many of us, I had dreams of writing, what exactly in my youthful exuberance I don’t know . Blogging has been wonderful for me as a creative outlet of both writing and photography and homemaking. Not the best out there and not the worst, just me. .-= Linda@bushel and a pickle´s last blog ..Some Things Never Change =-. I first stumbled onto Mary Kay Andrews when I ran across her blog one day. I had purchased one of her books several months before, not knowing who she was. When I made the connection, I read the book and enjoyed it. I am on my third now. I like them because they have characters who like to decorate. There are usually thrift shop finds, antiques or something to do with decorating involved. And a little mystery also. Apparently she wrote mysteries under another name, Kathy Hogan Trocheck. Oh, this place just oozes summer…and blended drinks with tiny umbrellas. Downloaded this book on my kindle yesterday and I am loving it! What a fabulous home. .-= Love Where You Live´s last blog ..A Master Bath Redo – Giving a Glam Look to a Generic Space =-. After studying a number of of the weblog posts in your website now, and I truly like your way of blogging. I bookmarked it to my bookmark website checklist and will be checking again soon. Pls check out my website online as properly and let me know what you think. Very attractive and cute. I wonder how many square feet.